In recent years the Netherlands have expanded their economy as much as to become one of the most strong and profitable in the European Union. Their large financial sector and their progressive and open attitude have proven to be just a few of the major drivers of their growth. Speaking of which, the country took great advantage of its location, closest to the European regions with the maximum population density, in order to create large exchange networks; having almost 70% of its imports and about 80% of its exports addressed to European nations, the Netherlands are the third largest exporter in the Euro area. Exports rose 1.5% in 2016 and include machinery and transport equipment (28%), mineral fuels (23%), food (11%). This should be enough to state that the Netherlands are highly dependent on the European Union, although recent happenings have caused discontent among the population and are paving the way to radical changes in the government structure as a whole. What is upsetting the Dutch is the monetary policy the ECB has been pursuing lately: ultra-low interest rates are hurting the country’s savers, especially pensioners. The latter are so fed up with the current situation that more and more of them are starting to support anti-EU political parties. As a matter of fact, the Dutch will be called to vote on 15 March. The two leading parties, People’s Party for Freedom and Democracy (VVD), led by the current Prime Minister Mark Rutte and the far-right Party for Freedom (PVV), an extremist party opposing to the Dutch establishment, led by Geert Wilders, are contending for victory. Wilders, the so-called “Dutch Trump”, has clarified his views and intentions in the “manifesto”, the platform of the Party for Freedom published ahead of the elections. Along with stating his aim to “de-Islamize” the Netherlands (close all mosques, ban the Koran and any Islamic symbol), Wilders has publicly expressed his will to leave the EU. “Enough of the mass immigration, asylum, terror, violence and lack of safety. Here is our plan: instead of financing the entire world and the people we do not want here, we give our money back to the common Dutch person. The so called “Nexit” (Netherland exit) would be proposed to citizens straight after the elections by means of a referendum, according to Wilders. Seizing on the “Brexit” victory, his intention is to follow their example as well as to form an alliance with the United Kingdom in order to achieve common goals. The main difference between the two countries, which could prevent the Netherlands from a successful outcome, is the fact that the UK has never been absorbed in the Euro zone, which could make it more likely for them to suffer the effects of Brexit in the long term. Moreover, the former would be struck by incredibly high costs in case of “Nexit”; Wilders’s pledge to close the Dutch borders would impede trades which, as previously mentioned, are one of the main sources of national income. In spite of the apparent damage Nexit could bring about, the pervasive discontent among the Dutch is proving to be decisive so as to grant votes to Wilders. His extremism has distanced all parties except for Thierry Baudet’s Forum for Democracy, which encourages Nexit but does not agree with the racist policies against Islam. 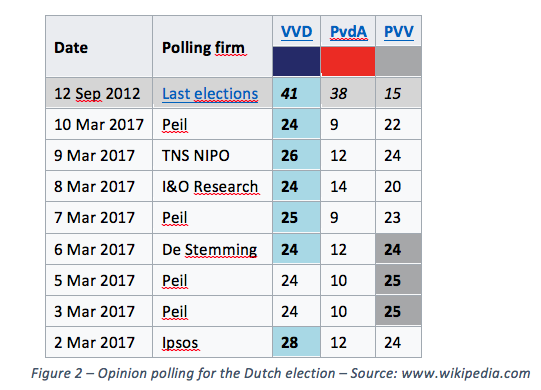 According to opinion polls, the Party for Freedom is neck and neck with Rutte’sPeople’s Party for Freedom and Democracy which actualizes the possibility to obtain a high percentage of votes. However, the fractured nature of the Dutch parliament requires a coalition government, which Wilders is unlikely to be able to form due to the lack of collaboration with sufficient parties. The last word will be spoken on 15 March.